Download "FACULTY OF SOCIAL ADMINISTRATION DEPARTMENT OF SOCIAL WORK"
1 FACULTY OF SOCIAL ADMINISTRATION DEPARTMENT OF SOCIAL WORK 1. NAME OF CURRICULUM Master of Social Work Program 2. NAME OF DEGREE Master of Social Work M.S.W. 3. OBJECTIVES 3.1 To produce graduates of social work with strong body of knowledge concepts and high competence in analyzing human and society in the dynamic contexts, 3.2 To produce graduates of social work with high levels of knowledge attitudes and skills in social work and social welfare practices gearing towards sustainable social development, 3.3 To produce graduates of social work with high capacities in creating and developing social activities of every level based upon diversity and social justice, and 3.4 To encourage graduates of social work in generating knowledge and applying indigenous wisdom in social work and social welfare development. 4. ADMISSION 4.1 Qualification: The applicant must have at least bachelor degree from a Thai or a foreign university accredited by the Council of Thammasat University. The applicant must have qualifications according to No. 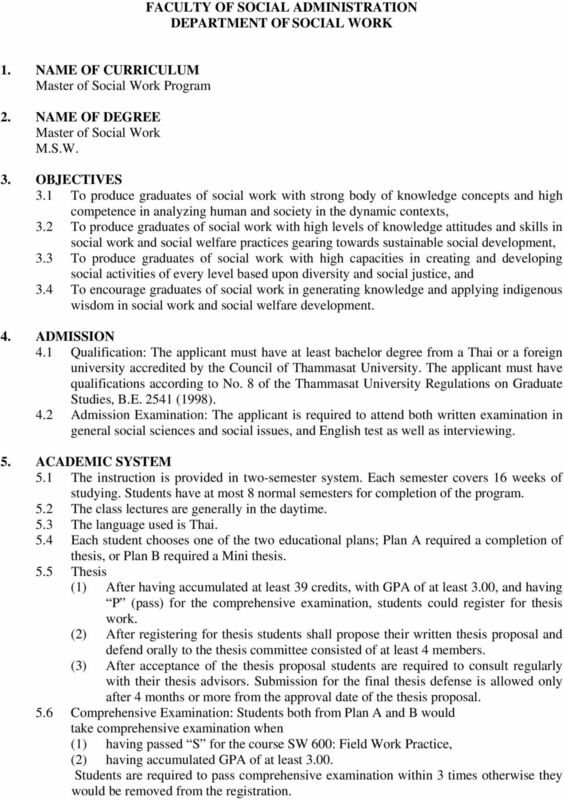 8 of the Thammasat University Regulations on Graduate Studies, B.E (1998). 4.2 Admission Examination: The applicant is required to attend both written examination in general social sciences and social issues, and English test as well as interviewing. 5. ACADEMIC SYSTEM 5.1 The instruction is provided in two-semester system. Each semester covers 16 weeks of studying. Students have at most 8 normal semesters for completion of the program. 5.2 The class lectures are generally in the daytime. 5.3 The language used is Thai. 5.4 Each student chooses one of the two educational plans; Plan A required a completion of thesis, or Plan B required a Mini thesis. 5.5 Thesis (1) After having accumulated at least 39 credits, with GPA of at least 3.00, and having P (pass) for the comprehensive examination, students could register for thesis work. (2) After registering for thesis students shall propose their written thesis proposal and defend orally to the thesis committee consisted of at least 4 members. (3) After acceptance of the thesis proposal students are required to consult regularly with their thesis advisors. Submission for the final thesis defense is allowed only after 4 months or more from the approval date of the thesis proposal. 5.6 Comprehensive Examination: Students both from Plan A and B would take comprehensive examination when (1) having passed S for the course SW 600: Field Work Practice, (2) having accumulated GPA of at least Students are required to pass comprehensive examination within 3 times otherwise they would be removed from the registration. 3 4. Social Welfare Administration Concentration SW664 Seminar in Social Welfare Policy and Administration 3 Credits SW681 Organization Theory and Social Welfare Administration 3 Credits SW682 Strategic Management in Social Welfare 3 Credits SW683 Social Welfare Supervision 3 Credits Elective Courses SW716 Community Organizing 3 Credits SW717 Management in System of Social Welfare Services 3 Credits SW718 Contemporary Social Welfare with Target Groups in Social Work Practice 3 Credits SW719 Psychosocial Pathology 3 Credits SW726 Health and Medical Social Work 3 Credits SW727 Psychiatric Social Work 3 Credits SW728 Dynamics of Social Work for Labor and Welfare Development 3 Credits SW729 Social Work Practice in Criminal Justice 3 Credits SW736 Probation, Pardon, Parole and After Care 3 Credits SW737 Legal Knowledge and Social Work Practice 3 Credits SW738 Law and Social Control 3 Credits SW739 Social Welfare in Education 3 Credits SW746 Evaluative Research in Social Welfare 3 Credits SW747 Research and Development in Social Work and Social Welfare 3 Credits SW748 Participatory Action Research in Social Work 3 Credits SW749 Policy Research in Social Welfare 3 Credits SW756 Ethnography and Social Work Research 3 Credits SW766 Social Policy and Administration for Marginalized Groups 3 Credits SW767 Social Policy and Administration in Public Health System 3 Credits SW768 Social Policy and Administration in Justice System 3 Credits SW769 Social Policy and Administration in Social Work in Education 3 Credits SW776 International Social Policy and Administration 3 Credits SW786 Social Resource Development and Administration 3 Credits SW787 Information System in Social Welfare 3 Credits SW700 Mini Thesis 3 Credits SW800 Thesis 36 Credits 7. DEGREE REQUIREMENTS A student will be acknowledged as a Master of Social Work when the following requirements are fulfilled: 7.1 Completion of all courses required in the curriculum and conform to all regulations issued by the faculty and Thammasat University 7.2 Obtain a minimum cumulative grade point average of Receive P for the comprehensive examination and the foreign language test 7.4 Receive S for the Field Work Practice 7.5 Receive S for either the final thesis defense or the mini thesis 7.6 Meet other criteria of the university regulations. 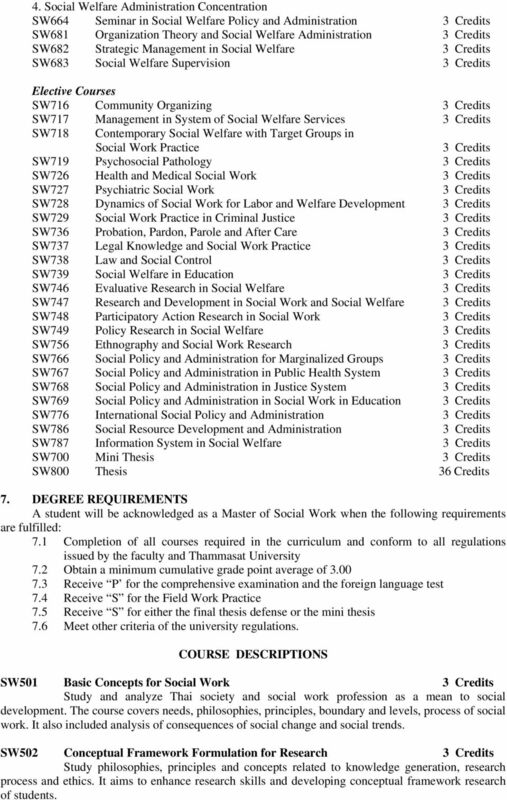 COURSE DESCRIPTIONS SW501 Basic Concepts for Social Work 3 Credits Study and analyze Thai society and social work profession as a mean to social development. 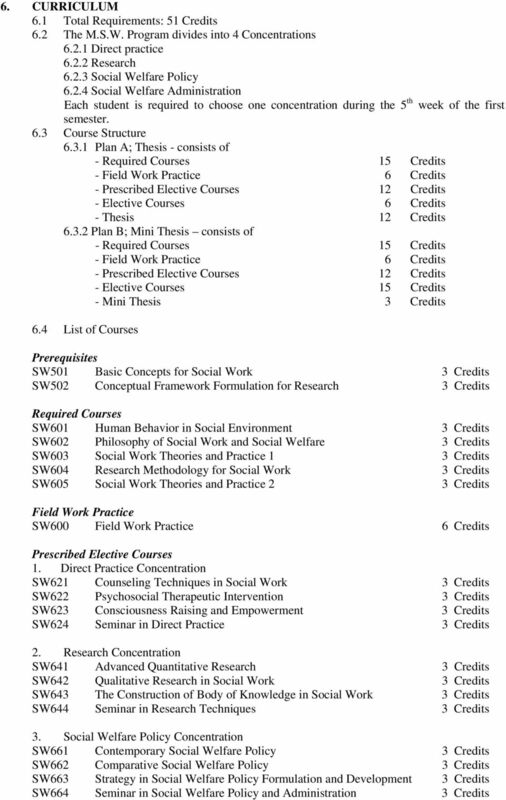 The course covers needs, philosophies, principles, boundary and levels, process of social work. It also included analysis of consequences of social change and social trends. SW502 Conceptual Framework Formulation for Research 3 Credits Study philosophies, principles and concepts related to knowledge generation, research process and ethics. It aims to enhance research skills and developing conceptual framework research of students. 5 research; consisted of various patterns of quantitative research, sampling and measuring theories and advanced statistical tools such as analysis of variance, multiple regression analyses, and others. Students are exposed to various statistical computerizing programs and are expected to be able to analyze those computer processed results. 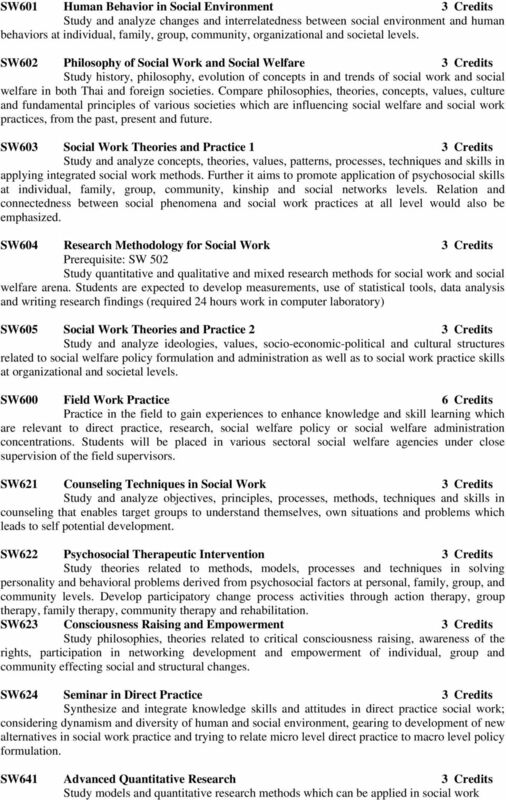 SW642 Qualitative Research in Social Work 3 Credits Study concepts and methodologies of qualitative research including principles, classifications and models of qualitative research. Further data collection and analysis, interpretation and presentation of research result are discussed. SW643 The Construction of Body of Knowledge in Social Work 3 Credits Study scientific methods and process for generating social work knowledge base, conceptualization, and integration among social work concepts with various research techniques such as meta-analysis, concept mapping and pattern analysis. SW644 Seminar in Research Techniques 3 Credits Synthesize and integrate research models, methods and techniques in order to be able to apply them in social work and social welfare. 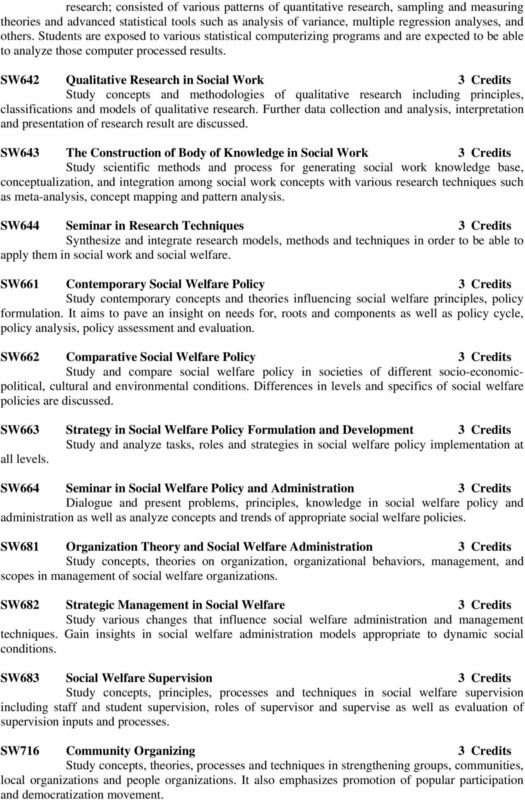 SW661 Contemporary Social Welfare Policy 3 Credits Study contemporary concepts and theories influencing social welfare principles, policy formulation. It aims to pave an insight on needs for, roots and components as well as policy cycle, policy analysis, policy assessment and evaluation. 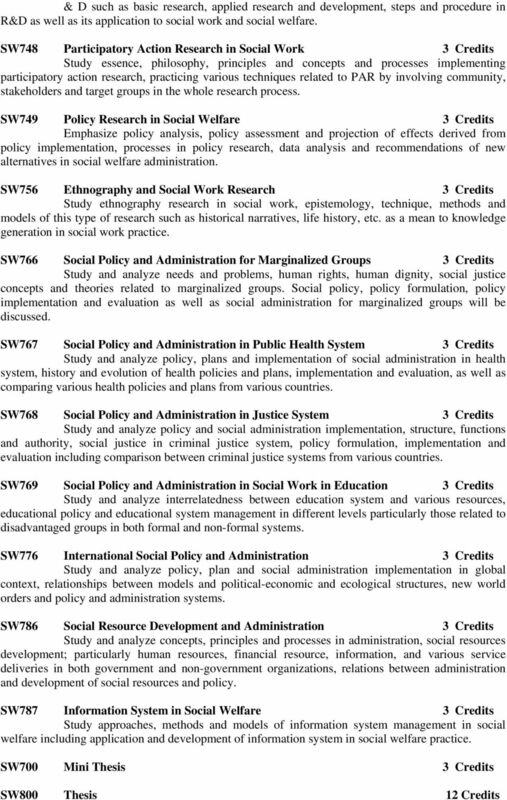 SW662 Comparative Social Welfare Policy 3 Credits Study and compare social welfare policy in societies of different socio-economicpolitical, cultural and environmental conditions. Differences in levels and specifics of social welfare policies are discussed. SW663 Strategy in Social Welfare Policy Formulation and Development 3 Credits Study and analyze tasks, roles and strategies in social welfare policy implementation at all levels. SW664 Seminar in Social Welfare Policy and Administration 3 Credits Dialogue and present problems, principles, knowledge in social welfare policy and administration as well as analyze concepts and trends of appropriate social welfare policies. 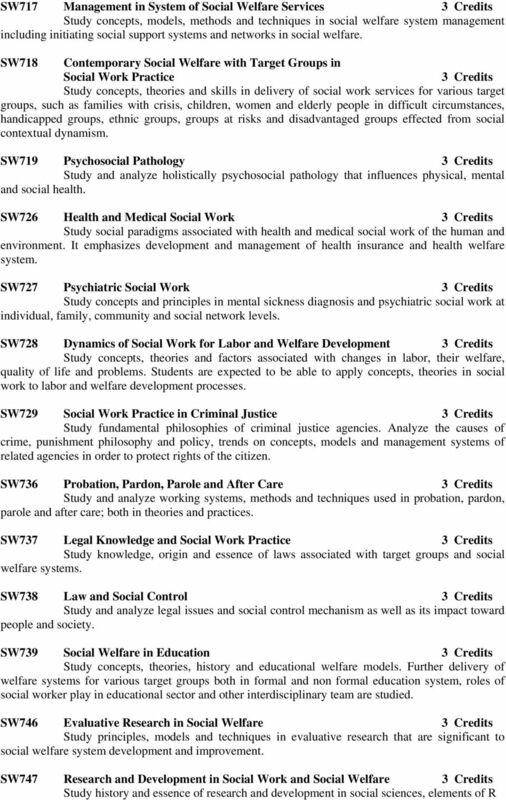 SW681 Organization Theory and Social Welfare Administration 3 Credits Study concepts, theories on organization, organizational behaviors, management, and scopes in management of social welfare organizations. SW682 Strategic Management in Social Welfare 3 Credits Study various changes that influence social welfare administration and management techniques. Gain insights in social welfare administration models appropriate to dynamic social conditions. SW683 Social Welfare Supervision 3 Credits Study concepts, principles, processes and techniques in social welfare supervision including staff and student supervision, roles of supervisor and supervise as well as evaluation of supervision inputs and processes. SW716 Community Organizing 3 Credits Study concepts, theories, processes and techniques in strengthening groups, communities, local organizations and people organizations. It also emphasizes promotion of popular participation and democratization movement. Members Absent: Dr. Donna Davis, Dr. Charles Eagles, Dr. Tom Lombardo (ex-officio), Dr. David Nichols, Dr. Karen Raber, and Mr. Philip Schwab. Graduate Council July 10, 2007 Minutes Members Present: Dr. Maurice Eftink (ex-officio), Dr. Jeffrey Hallam, Dr. Tim Letzring, Dr. Lynne Murchison (ex-officio), Dr. Charles Noble, Dr. Michael Repka, Dr.